Complete under-the-hood view of your system's behavior, clearly displayed and visualized, immediately available and up-to-date. Whether in development, testing or production, ServiceInsight provides all the system-critical information you need. ServiceInsight allows you to access and view all the reported, audited and collected information from all your endpoints. Every endpoint and every message is accessible and visible, with a complete contextual context linking the details into a coherent overall picture. 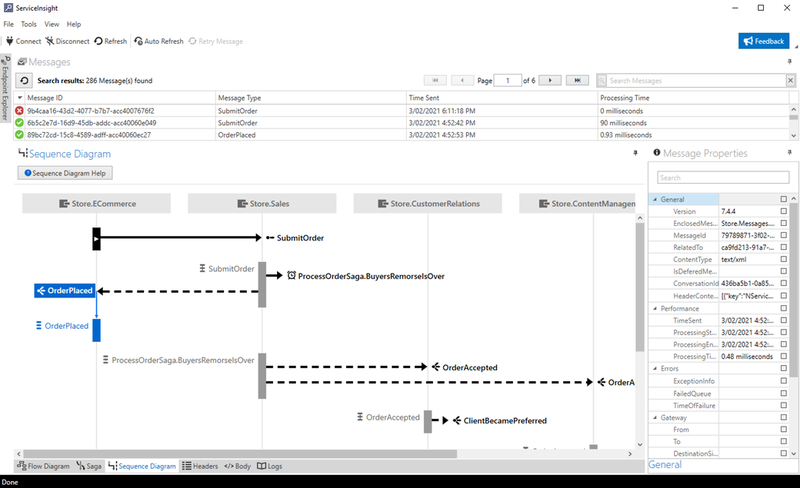 View the flow of messages between your endpoints and see how your endpoints interact. Analyze and debug long-running processes and workflow interactions with the Saga view, and monitor delivery, processing and overall performance down to the specific message level. Find any value contained within any message, endpoint or saga managed by your distributed system. Full-text search includes message body, message headers, saga properties, endpoint and hosting machine details and more. Immediate display of failed messages with full .NET stacktrace, comprehensive contextual display of the failure and the ability to immediately drill down into specific message details and compare them with other messages. Per-message and down to the millisecond display of the time taken to deliver a message, the message's processing time, and the overall end-to-end time. Send failed messages for reprocessing with a single click, once the cause of the initial processing failure has been detected and fixed. Use Auto-Refresh settings to automatically update the display with the latest information from the system's behavior, providing an up-to-date runtime view of your system's internal communication and activity.